Smart Vision IT solutions knows buying and selling products and/or services online now forms a major backbone of the modern economy in almost all the developed and developing nations of the world. Advancements and innovations in SCM (Supply Chain Management), Electronic Funds Transfer, EDI (Electronic Data Interchange), Internet marketing, Online Transaction Processing, Automated Data Collection Systems, and Inventory Management Systems, now allows the small business owner to have a more elaborate E-Commerce solution. Smart Vision IT solutions is highly experienced with a trusted provider status in providing high performance E-Commerce solutions and has become the #1 choice of many leading companies in Dubai and the Middle East who are processing millions of online sales and transactions each week. Smart Vision’s E-Commerce solutions are geared for small to medium sized enterprises; our solutions have been robustly developed and updated to suit the most demanding bespoke business requirements. Smart Vision IT solutions has a successful track record in delivering B2B and B2C ecommerce solutions. Our solutions are client goal driven; we deliver consistently on time and within budget. We believe our ecommerce solutions are a perfect fit for most models or requirements. We provide a complete and comprehensive feature list for all clients. Our ecommerce solution can be tailored with bespoke branding and design. Our solutions are capable of high volume transactions and are truly scalable. Our ecommerce solutions are a complete fit for all types of uses, click here to see a complete list. Major trading institutions and organisations have chosen Smart Vision IT solutions for their E-Commerce solution to diversify their business and take it to a whole new level. Our clients have expanded their business growth and income opportunity around the world with Smart Vision’s E-Commerce solutions. Smart Vision IT solutions provides the E-Commerce solution that’s right for you! No cookie cutter solutions here! Our custom E-Commerce development will allow you to acquire a stronger foothold in the internet market selling or providing any goods or service. Smart Vision’s solutions are ideal for companies who have outgrown their first or second generation ecommerce solutions, and are seeking a better solution that provides more flexibility and is more robust to support their changeable and unique requirements. 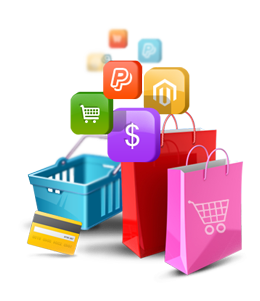 Smart Vision IT solutions develops E-Commerce websites that are user friendly. Acquiring that dream gadget or a favourite music CD can be done effortlessly and easily with a click of a button. Smart Vision IT solutions will put you in the world wide arena of E-Commerce today. Don’t miss the opportunity to sell your product or service to the world! E-Commerce has been categorised into four parts, depending upon the associated parties carrying out the transaction. Consumer to Consumer, or peer to peer (C2C or P2P).